The gritty southern drama Joe premiered at the Venice International Film Festival on August 30th, and played again in Toronto for its North American premiere on Monday September 9. The film is adapted from the 1991 novel of the same name by Larry Brown and stars Nicolas Cage (Leaving Las Vegas) and Tye Sheridan (Mud). Joe is directed by David Gordon Green, who seems to be changing his focus after 2011 lowball comedies The Sitter and Your Highness (see also the forthcoming Manglehorn). The plot centers on the middle-aged Joe Ransom (Cage), a working class ex-con who is rough around the edges but seems to have a good heart. Ransom aides and mentors hard-working 15 year old Gary Jones (Sheridan), who is in need of a real father figure – his biological father is a lazy, abusive alcoholic. The performances of the two stars are widely considered highlights of the film. David Rooney of The Hollywood Reporter praised Cage’s performance saying, “Where [the film] really works is Cage’s bone-deep characterization of a man at war with himself…as a protagonist, the sullen loner scarred by life and prey to his own violent instincts seems a well worn figure. 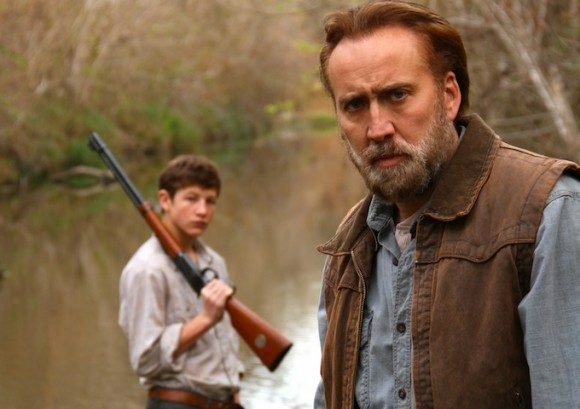 But there’s a soulfulness and integrity to Cage’s Joe that keep him real as he takes Gary under his wing and shows him genuine kindness.” Sheridan, in a role that is somewhat similar to his character in Mud, received the Marcello Mastroianni Award for the best upcoming young actor at Venice. In all, Joe is what it sets out to be: a violent but soulful exploration of masculinity, depravity and redemption. It’s still seeking distribution, so no word yet on when the public might get a chance to see the film. See what audiences and critics are saying about more festival premiers here.